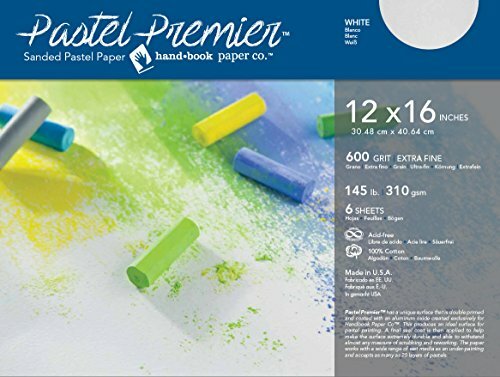 Pastel Premier is a Sanded Paper surface made from 100% cotton heavy-weight 145lb paper. It is double-primed and coated with a specially-made aluminum oxide that creates a 'grit' ideal for pastel work. Other media such as color pencil, conte, oil, and acrylic paint can also be used on the durable finish. This pochette (a French term meaning "small pocket") contains 6 sheets of white 600 grit/extra fine Pastel Premier Paper in 12 x 16 inches. Made in the USA. If you have any questions about this product by Handbook Paper, contact us by completing and submitting the form below. If you are looking for a specif part number, please include it with your message.